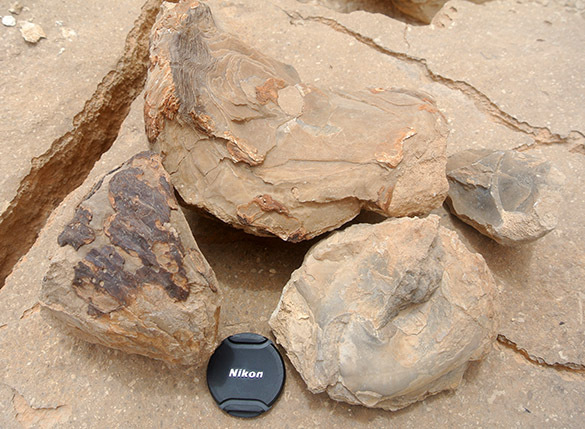 These beaten-up fossils have served me well in the field this month. They are the regular echinoid Heterodiadema lybicum (Agassiz & Desor, 1846). 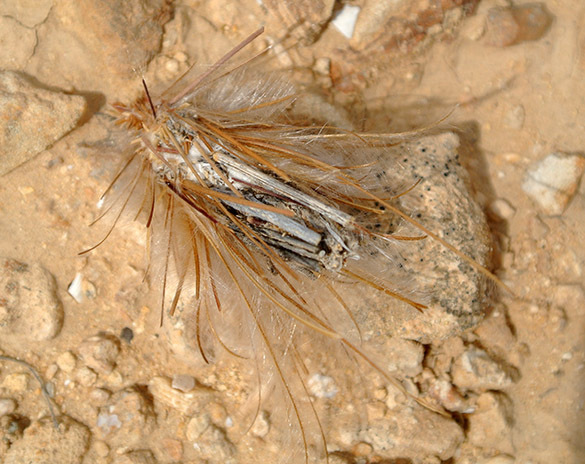 They are common in the Cenomanian throughout northern Africa and the Middle East. 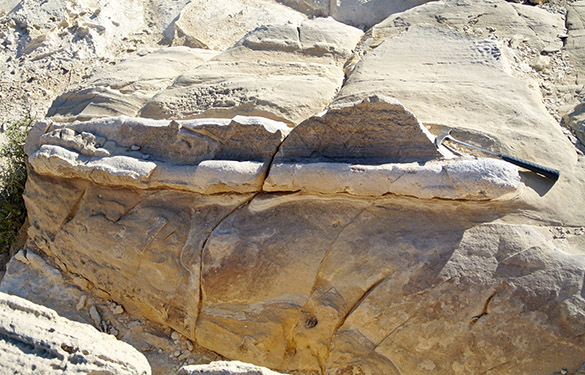 These particular specimens, the other sides of which are shown below, are from the En Yorqe’am Formation we’ve been studying here on the rim of Makhtesh Ramon, southern Israel. When I find them in abundance I know I’m in the top half of that formation. 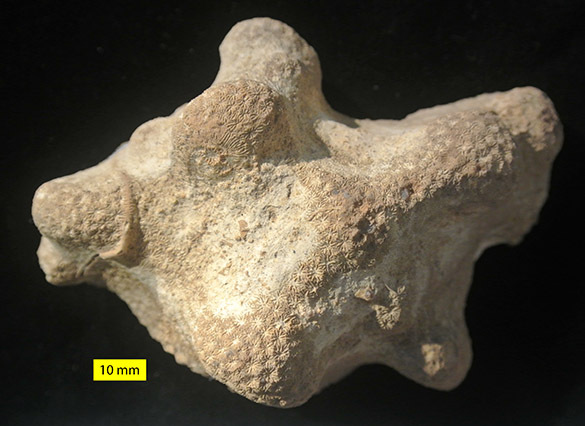 They’ve previously been featured indirectly as a Fossil of the Week for the bites they made into the shells of oysters, producing the trace fossil Gnathichnus. 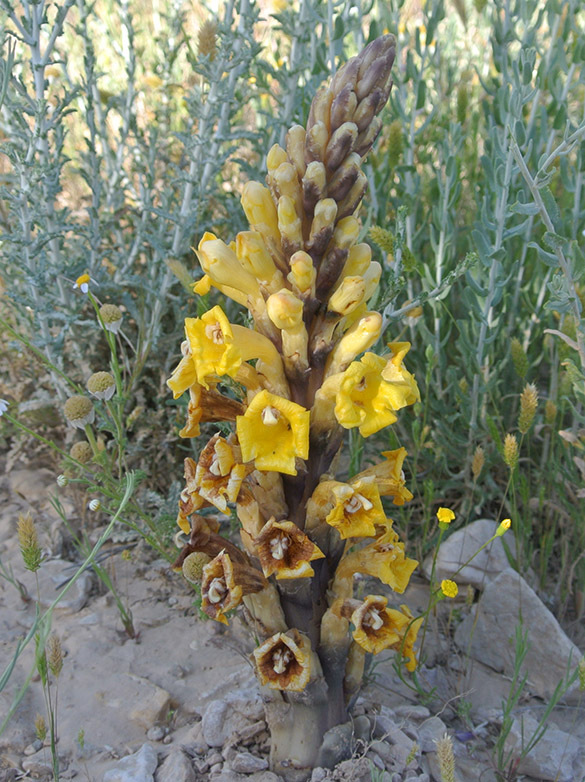 The species Heterodiadema lybicum was named by Pierre Jean Édouard Desor (1811-1882) in 1846. We’ll meet him in a later entry. 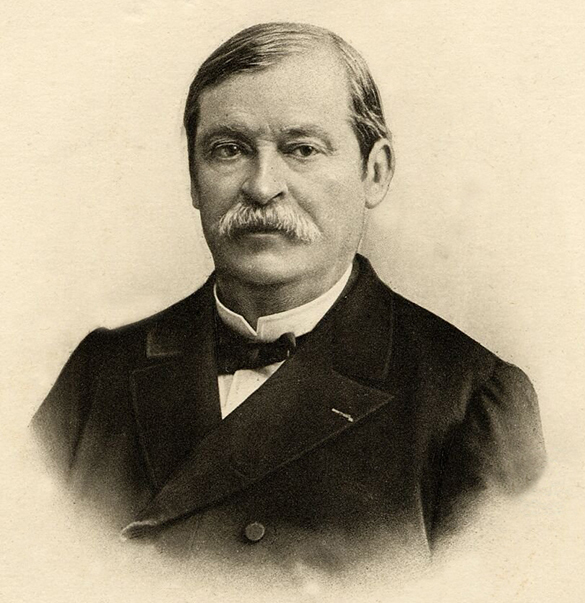 The genus Heterodiadema was erected in 1862 by Gustave Honoré Cotteau (1818-1894), who is pictured below. There is not much at all about Cotteau in the English literature, but with Google Translate I was able to sort out a bit of his story from the French. He was one of those glorious amateurs who make such important contributions to the science of paleontology. (I like the new term “citizen scientists” for this group, although I emphasize I’m a citizen too!) Cotteau was a judge in Auxerre, Burgundy, France. In his spare time he had a passion for living and fossil echinoids, eventually amassing a collection of over 500 species. 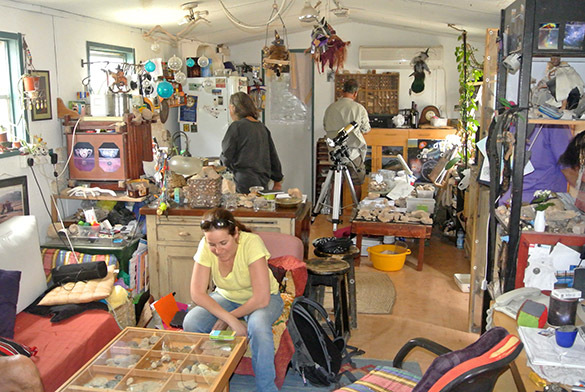 He was also, as you might guess, a volunteer curator of the city museum in Auxerre. In 1889 he was President of the Société zoologique de France, a highly prestigious position. He was an important force in the early understanding of echinoderms. 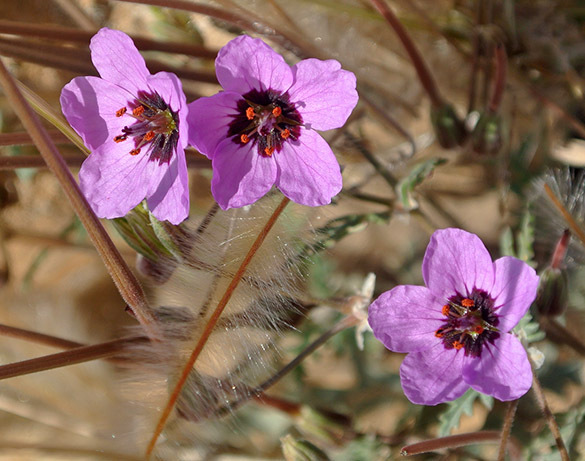 Again, these specimen photos were taken under “field conditions” in Israel with a cleaner’s cloth for a background. As you read this, though, I am with luck back in my cozy home in Wooster. Agassiz, L. and Desor, P.J.E. 1846. Catalogue raisonné des familles, des genres, et des espèces de la classe des échinodermes. Annales des Sciences Naturelles, Troisième Série, Zoologie 6: 305-374. Geys, J.F. 1980. Heterodiadema libycum (Agassiz & Desor, 1846), a hemicidaroid echinoid from the Campanian of Belgium. 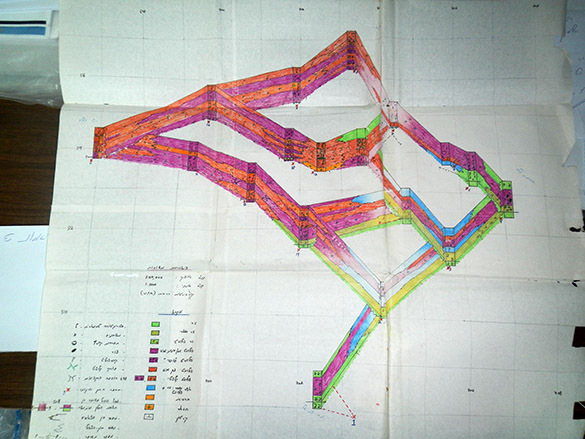 Anales de la Societe geologique du Nord 99: 449-451. Smith, A.B., Simmons, M.D. and Racey, A. 1990. 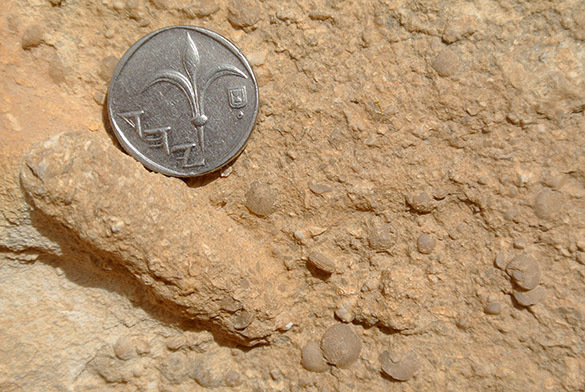 Cenomanian echinoids, larger foraminifera and calcareous algae from the Natih Formation, central Oman Mountains. Cretaceous Research 11: 29-69. 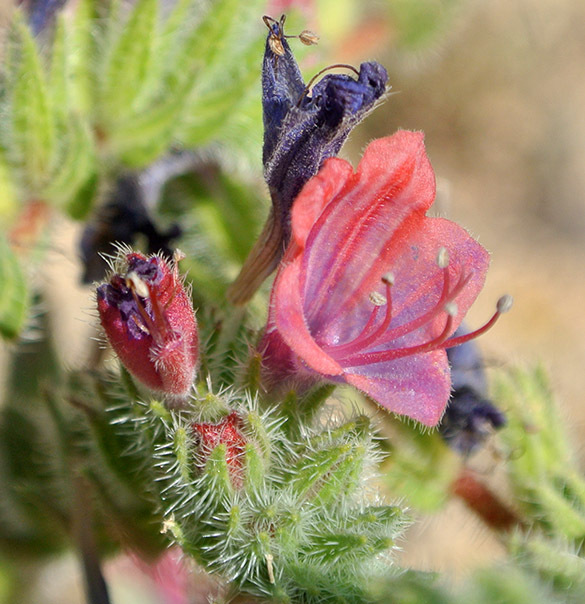 MITZPE RAMON, ISRAEL–Today Yoav Avni and I drove south to meet an enthusiastic group of naturalists in Arava of the Jordan Rift Valley. 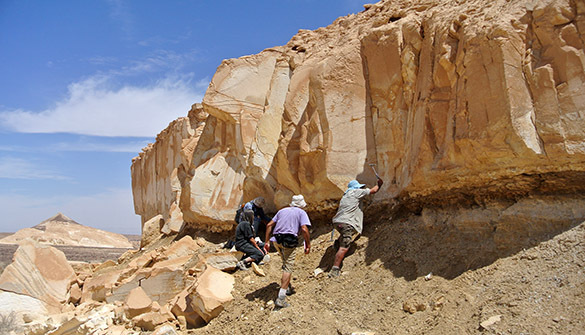 The group is led by Dr. Hanan Ginat and consisted of a micropaleontologist and three amateur collectors who have all added considerably to scientific knowledge. We did fieldwork together in the magnificent Menuha Formation (Upper Cretaceous). 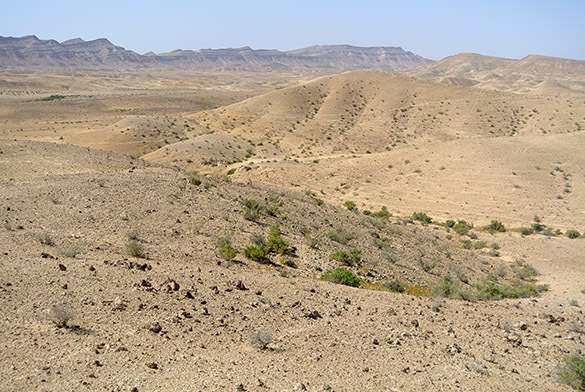 The outcrop above is the boundary between a middle unit of the Menuha (“M-2”) and the upper chalks (“M-3”) in Wadi Zichor. 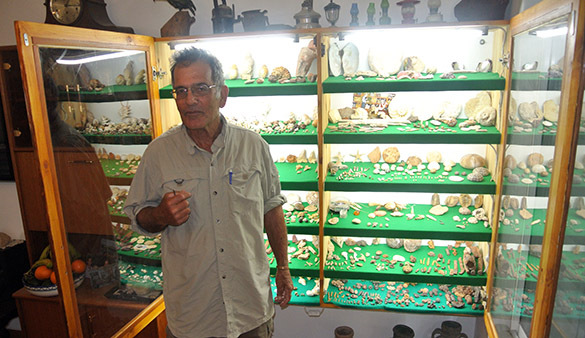 Here is Gidon and a fraction of his collection, which is mostly from the local Cretaceous. There were fossil types here I’ve never seen before. Like all good citizen scientists, he knows how to collect and observe with location and stratigraphic control, and he has learned an immense amount about fossils and the organisms they represent. 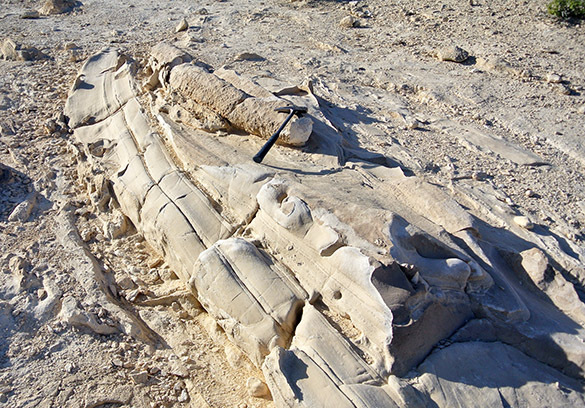 Winny collected this four-meter long Cretaceous fish named Stratodus. She must now be the world’s expert on its complex anatomy. It is just a taste of her other fossils, including a bryozoan-encrusted ammonite from the Ora Formation (Turonian) she freely and eagerly gave me for research. 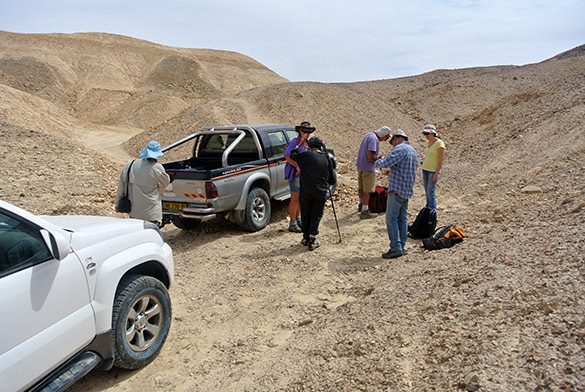 The field party is here assembled to study a site where they helped find and excavate an Elasmosaurus plesiosaur — the first in Israel. 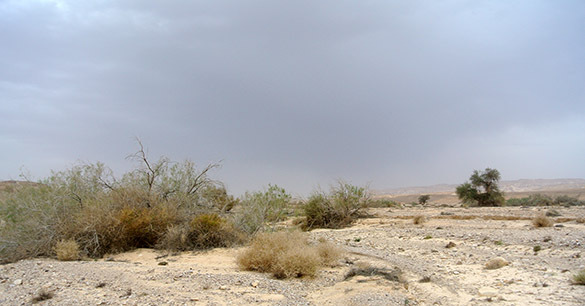 A view of the Menuha Formation in the Arava. 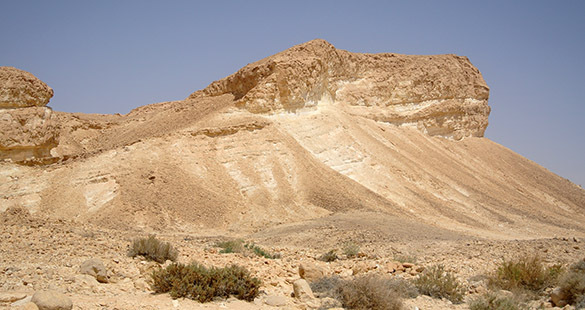 This is an extraordinary outcrop, and you can tell by the minimal vegetation that this is the driest part of the Negev. I very much enjoyed my time with this fun and dedicated crew. They reminded me so much of the naturalists I grew up with in my own desert home of Barstow, California. I made many connections here that will benefit future research programs and Independent Study projects for Wooster students. It was inspiring to see what joy these people have in pursuing their scientific passions, like all other citizen scientists I work with. This was my last day of fieldwork on this expedition. Tomorrow the long trip home begins! MITZPE RAMON, ISRAEL–Very early this morning (5:05 am) Yoav and I boarded a bus in Mitzpe Ramon for a journey north to Jerusalem. After a change of buses in Beersheva, we arrived in Jerusalem 3.5 hours later. (This is Yoav’s commute to his office!) 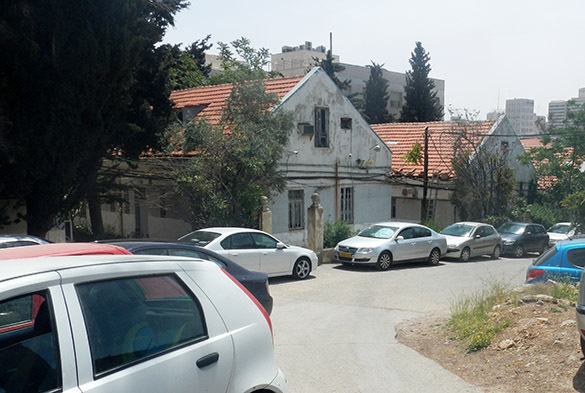 I was scheduled to give a morning talk at the Geological Survey of Israel‘s headquarters in a crowded haredi (ultraorthodox) neighborhood. It is always a moment to leave the noisy streets and pass through a gate onto the campus of the Survey, shown above. This is an old British military base from the 1940s, and it shows the wear. The parking here is incredible. The cars are closely imbricated. Drivers who blocked other cars leave their phone numbers on their windshields so they can be summoned to move. Some just leave their keys inside for others to shift them out of the way. Here’s an advantage of taking the bus! The Survey will have a new campus elsewhere in the city in about four years. Geologist and good friend Amihai Sneh is here setting up chairs for the talk in the conference/tearoom. Here’s my lecture set-up ready to go. 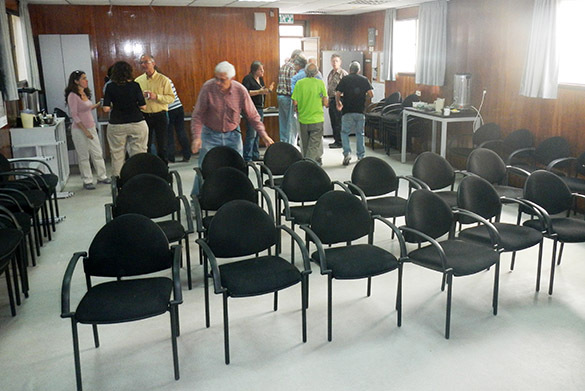 The talk went well enough, and my geological colleagues had a lot of good comments and ideas afterwards. As with any presentation, I was most pleased to have it over! 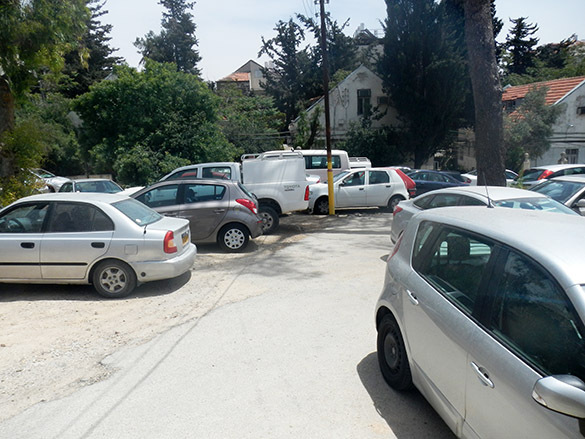 After the talk and lunch, Yoav, Amihai and Eitan Sass (a well-known Israeli geologist and former advisor of Yoav) planned a fieldtrip to further explore Cenomanian units in an attempt to solve some correlation dilemmas. This is the same project we have been working on with the En Yorqe’am Formation to the south. We actually used Yoav’s equivalent of an Independent Study thesis he completed over 25 years ago in Jerusalem. It looks like a master’s thesis. A critical fence diagram from the work is shown above. It was very useful in our explorations. Yoav is here examining an exposure of the Bet Meir Formation in the Newe Daniel settlement in the southern West Bank. We examined it in several places, noting changes in the amount of dolomitization and fossil content. It was best exposed here because of recent construction. Dr. Sass has studied these nodules in the Bet Meir Formation and concluded they are after anhydrite nodules. In fact, some still have anhydrite entombed within later quartz replacement. This chalky sediment was likely influenced by flows of dense brines from nearby shallow evaporitic basins. Did I mention we were in the West Bank? This was very interesting, and an unexpected visit for me. 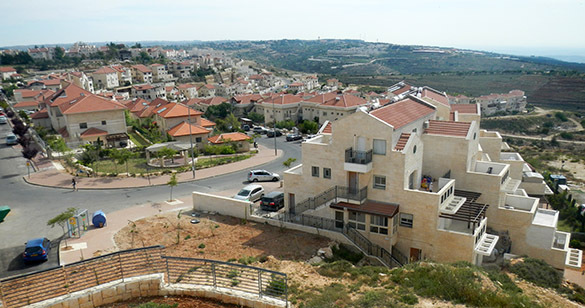 These settlements are entirely normal once you’re on the inside, but the various layers of security measures on the outside are impressive. I learned a lot about the history of this particular place from my colleagues. Complex, to say the least. 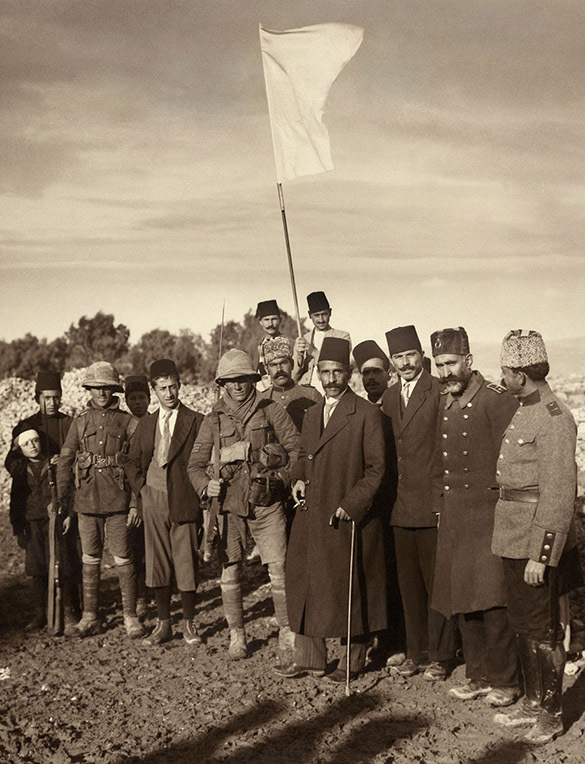 History moment. 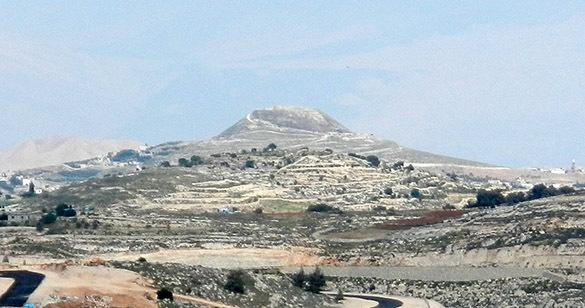 From a tower in Newe Daniel you can see a curious conical mountain called the Herodium. It is far too steep to be natural. It was constructed by Herod the Great as a palace and his tomb. The recent discovery of the actual burial site is a dramatic story. 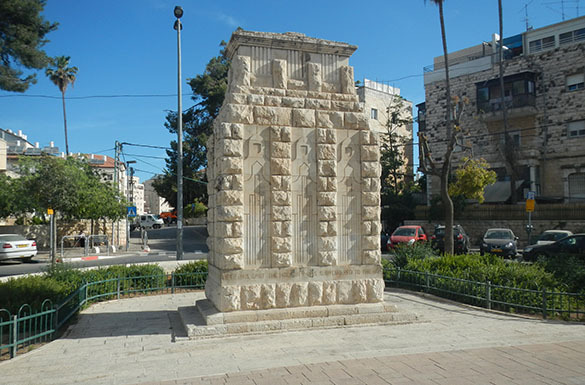 Bonus history moment: On the walk from the bus station to the Survey headquarters, Yoav and I passed this monument to the surrender of Jerusalem to British troops on December 9, 1917. This too is a good story. It happened on this spot. Check out the famous image below from that day. 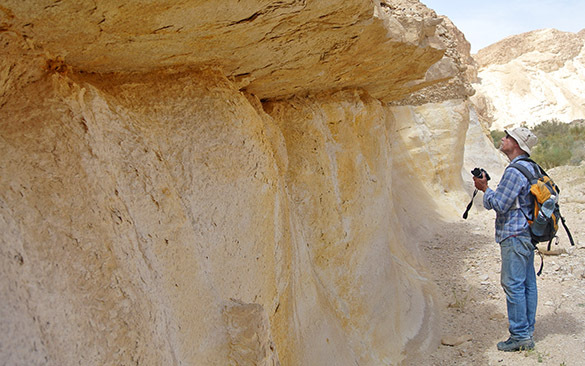 MITZPE RAMON, ISRAEL–“Like a hot dog in a bun.” Late this afternoon, while exploring the Eocene (Lutetian) Horsha Formation near the Nabatean/Roman/Byzantine city of Avdat, Yoav Avni and I ran across these odd features in a limestone layer within the chalks (near N 30.79119°, E 34.75494°). They consist of an elongate core of coarse, bioclastic sediment (the hot dog) in chalky sediments folded around them (the bun). They are all oriented in the same direction. Some are as big as canoes; others like gravy boats. We suspect that these are seismites — sedimentary sturctures formed by seismic shaking. The chalky, water-saturated sediment would have responded plastically as the slightly denser bioclastic sediments above collected in troughs and then began to descend down into the chalk. This is just an idea. If someone else has seen structures like these, please let us know! Just below these funny structures is this nice Byzantine cistern filled with water. 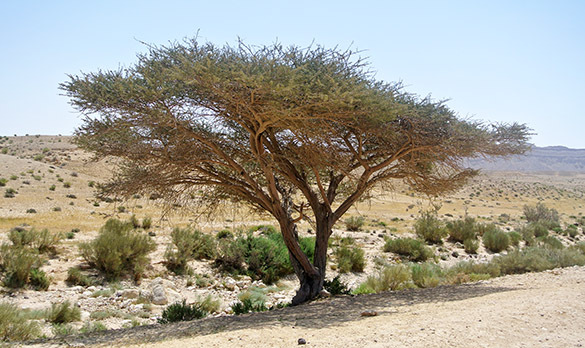 It is on the edge of a wadi, with about a half-meter step above the wadi base. It has this narrow doorway that leads into an interior cavern, all hand-carved. 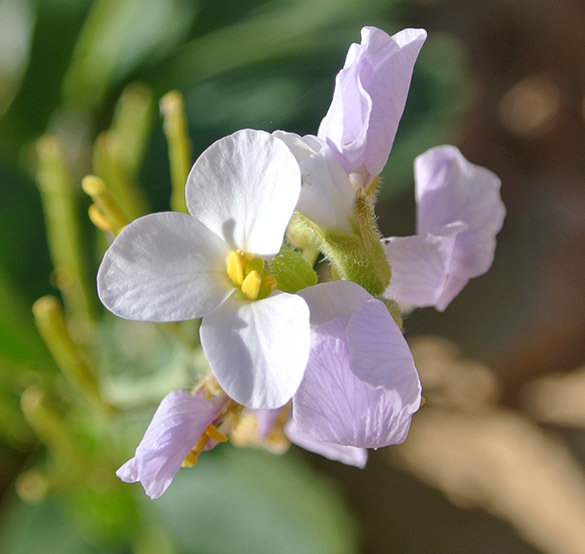 During a flood, the water reaches a level in the wadi where it begins to decant into the cistern, reducing the amount of sediment that would otherwise fill the cavity quickly. 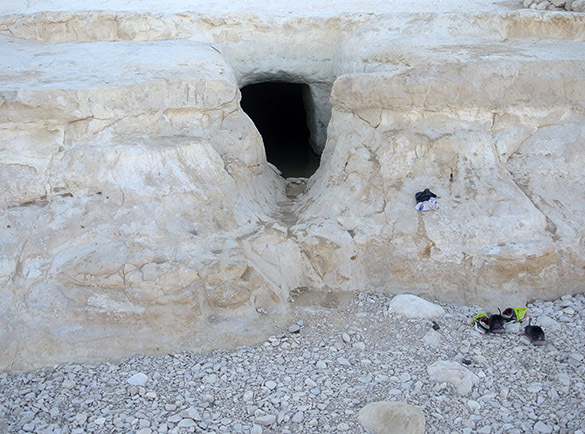 A couple of years ago Yoav organized a team to excavate centuries of silt from this cistern. 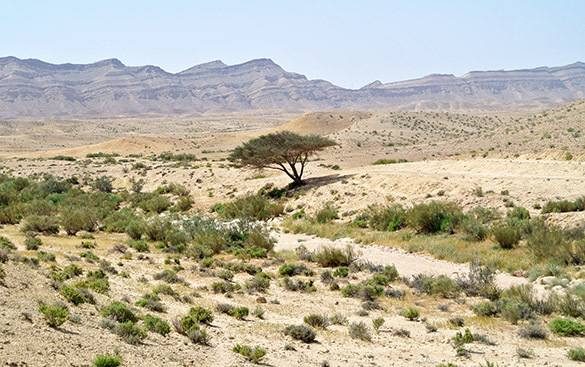 Now it is full from the winter rains, providing a water hole for the local Bedouin children. It also shows that the Byzantine water storage and conservation techniques of 1500 years ago still work fine today. MITZPE RAMON, ISRAEL–Yoav and I had a long hike today into the Eocene succession of rock units in the northern Negev. We wanted to look especially at the Horsha Formation (Eocene, Lutetian) because it has some cool trace fossils and massively large oysters. Along the way there are also interesting features like submarine debris flows, thick chalk deposits, unconformities and faulting. Despite the sunshine in the top image, we started the day with a thunderstorm at our back. It was the first time I’d heard thunder in Israel, and for awhile we contemplated in which rocky crevice we should take cover. (It’s not like we carry raingear with us here.) We did get rained upon, but not seriously. 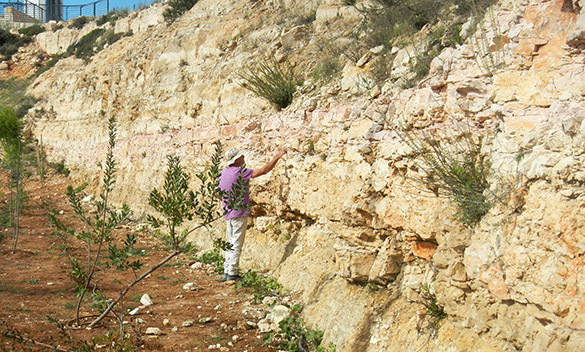 Yoav is here looking at a thin limestone unit near the base of the Horsha Formation (at GPS 072; N 30.32537°, E 35.00653°). Note the sharp base and yellowish mineralization of the chalk. 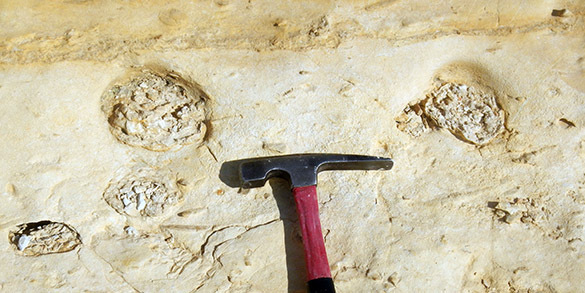 There are fantastic trace fossils in convex hyporelief on the base of this limestone layer. The small disks near this trace are nummulitid foraminifera. They are a major component of this limestone. There are also many broken bits of calcareous algae. These giant oysters are common in this unit. 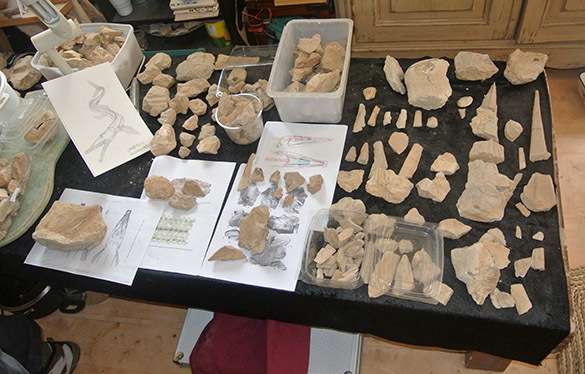 Some are bored, which you might be able to see in the specimen on the far left. We will return to this area tomorrow for continued exploration. 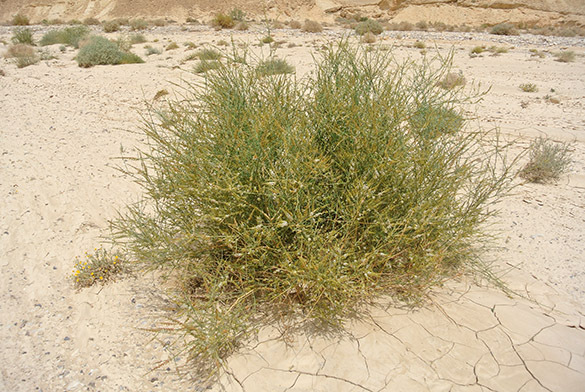 On the long way back to the car we encountered this shrub. I wish I knew the name. Yoav said it was called “Bread of the Monks”, but that has led me nowhere. 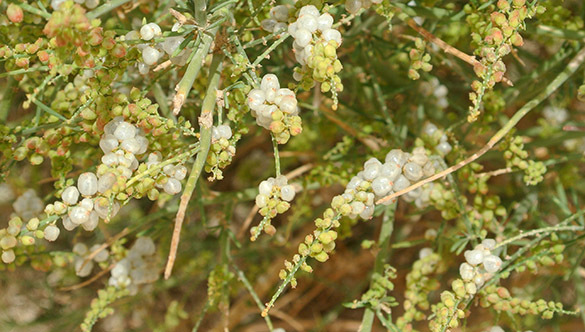 It may be Ochradenus baccatus, also known as sweet mignonette. I’m not one to eat wild plants I don’t know, but Yoav assured me the berries on this shrub were tasty. Indeed. Sweet like blueberries. Worth the risk! This is a top view of the coral. It has a generally flat base and an upper surface with extended knobs. Usually this particular species is flat across the top as well as the base, giving it a platter shape as in this previous Fossil of the Week. Flip the coral over and we see how it is preserved. 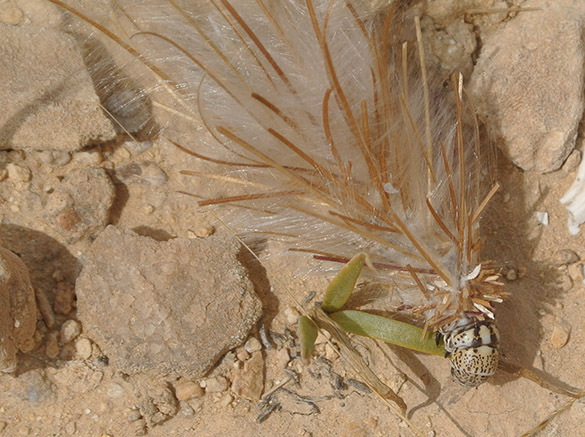 The skeleton was originally made of the mineral aragonite, which dissolved after the death and burial of the colony. 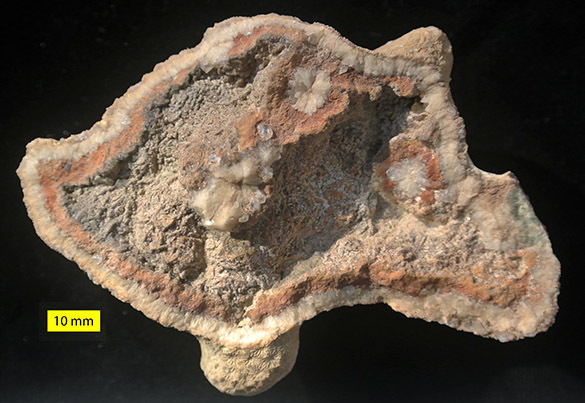 The resulting void was filled with stable calcite, preserving even fine details of the septa (see below). This delicate preservation, though, is only of the exterior of the skeleton. The interior is coarsely crystalline calcite with no trace of internal coral structures. This preservation, then, is properly called a cast, not true replacement. 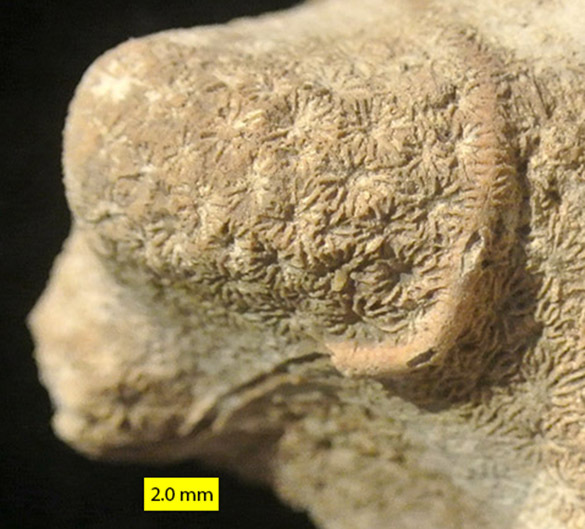 These scleractinian corals had many symbionts (organisms that lived with them). Among them were tube-dwelling worms, probably polychaetes, that spread across the surface. We know this happened while the coral was alive because, as seen above, the septa sometimes grew over the tubes. The tubes themselves are here preserved in three dimensions because they are originally calcitic and did not dissolve after death and burial. 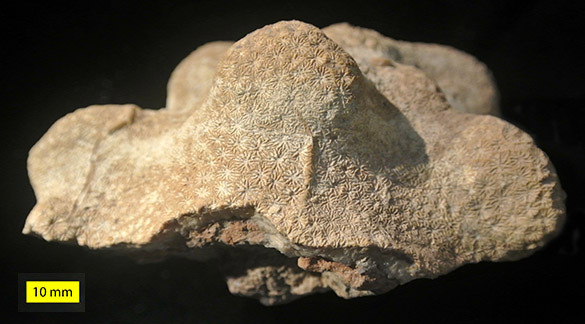 We have much to learn about these gorgeous Jurassic fossil corals of Israel. They are virtually unstudied and offer a great opportunity for comparing them to the global Jurassic coral world. Martin-Garin, B., Lathuilière, B. and Geister, J. 2012. The shifting biogeography of reef corals during the Oxfordian (Late Jurassic). A climatic control?. 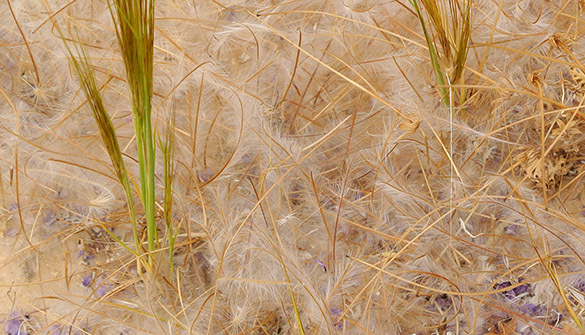 Palaeogeography, Palaeoclimatology, Palaeoecology 366: 136-153. Reolid, M., Molina, J.M., Löser, H., Navarro, V. and Ruiz-Ortiz, P.A. 2009. Coral biostromes of the Middle Jurassic from the Subbetic (Betic Cordillera, southern Spain): Facies, coral taxonomy, taphonomy, and palaeoecology. Facies 55: 575-593. 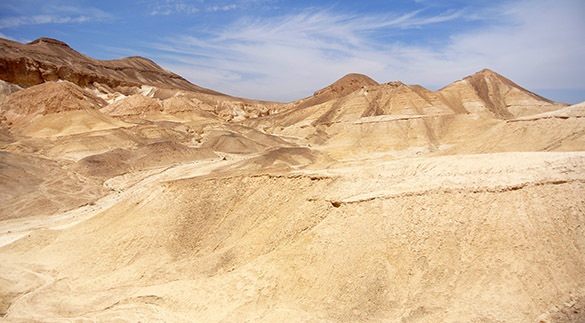 MITZPE RAMON, ISRAEL–Usually on Saturdays Yoav Avni and I do something “touristic”, like visit an archaeological site or museum. Since it is the Passover holiday, though, and we are both averse to crowds, we decided to do a little stratigraphy outside Mitzpe Ramon instead. 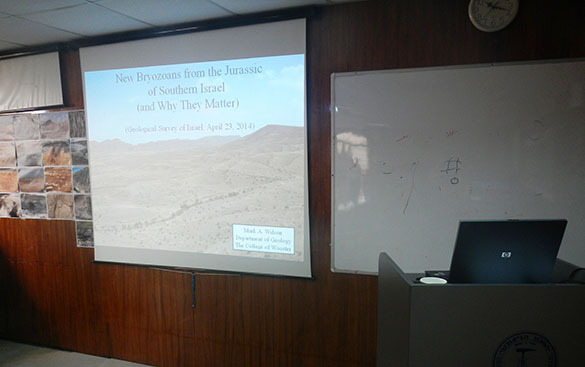 Our challenge from Amihai Sneh was to sort out the lower boundary of the En Yorqe’am Formation (Upper Cretaceous, Cenomanian), so we added another section to our argument. The above image is taken from N 30.62947°, E 34.82085°, about three kilometers northeast of town along the rim of Makhtesh Ramon. (Check those coordinates out on Google Maps. Very cool, especially if you tilt the Earth image to show the cliff edge.) The three critical formations are labelled above with our new concept. 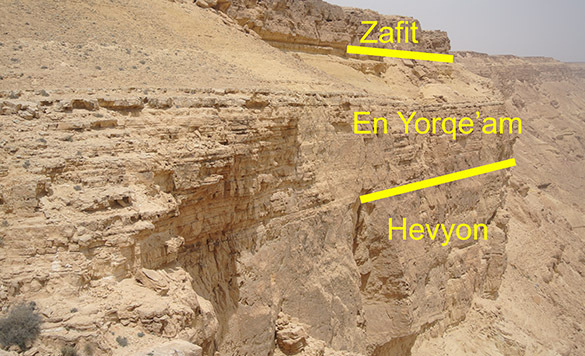 The top boundary of the En Yorqe’am with the Zafit Formation is not controversial; it’s the base of the En Yorqe’am that is at issue. Presently it is defined as the top of the cemented carbonates shown just above the “Y” of En Yorqe’am. With this definition the unit is about 20 meters thick — less than half its thickness elsewhere. This has led to some tectonic arguments about uplifts, erosion and unconformities that are not supported by the record in the rocks, other than this anomalously thin section. From our studies of the boundary to the south, we believe we have good evidence to put it here between the massive and bedded limestones as shown. The fossils support this (especially oysters) and the thickness of the En Yorqe’am goes back to an expected 50 meters or so. That’s the argument we’re going to make to Amihai, at least. I will see more of this unit with Amihai further north next week. 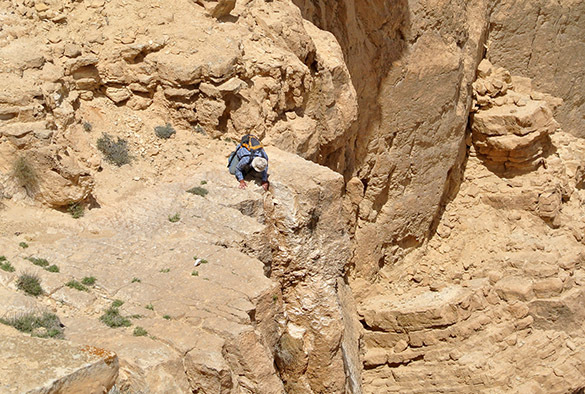 Here Yoav is standing on what we consider the top of the Hevyon Formation, with the En Yorqe’am behind him. Let me emphasize to Gloria and my Mother: that is not me on that precipice! Yoav is here checking the lithology and paleontology of the top Hevyon. It all ended well. 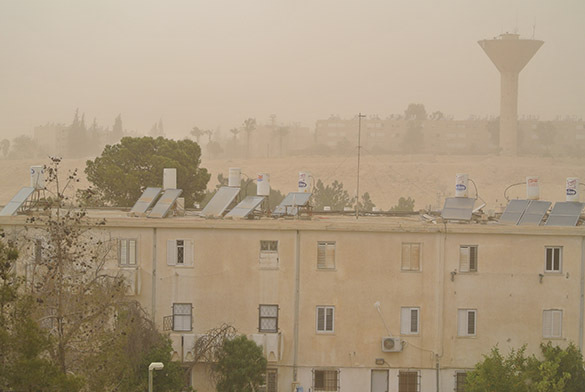 We got back just as a massive wind and dust storm swept into town. A front is moving through from north Africa. They say it could rain, but I don’t believe it. 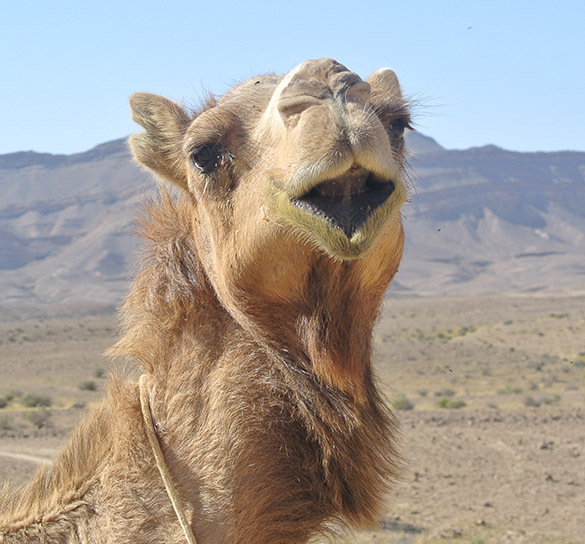 MITZPE RAMON, ISRAEL–It is a problematic relationship between camels and me. My first experience with a camel out here was watching one eat my lunch, bag and all, when I foolishly left it in the shade of the vehicle while I measured a section. My students and I have been dissuaded more than once from visiting a particular outcrop by aggressive, bellowing camels standing their ground and looked very, very big and toothy. I was thus a bit hesitant when Yoav just walked up to this beauty on our way to the center of Makhtesh Gadol. I followed and did just fine within touching distance. This is a female (hence the lack of attitude) and a pregnant one at that. She is part of a small herd owned by a Bedouin family that may or may not have an arrangement to graze animals in this nature reserve. She eased my camel anxieties. After our encounter I realized that camels actually play a role in our work. 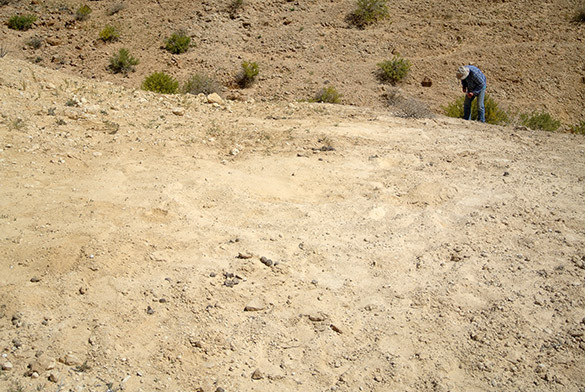 This is one of our most productive fossils sites (“GPS 055”). It is an exposure of a marl in subunit 51 in the Matmor Formation. This is also a camel resting spot. 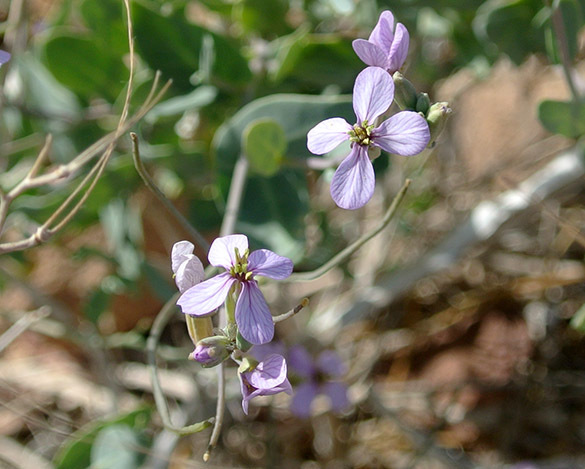 They love the soft sediment, probably as a break from the rocky soil elsewhere. We thus find such dry camel wallows often in our explorations of the Matmor. 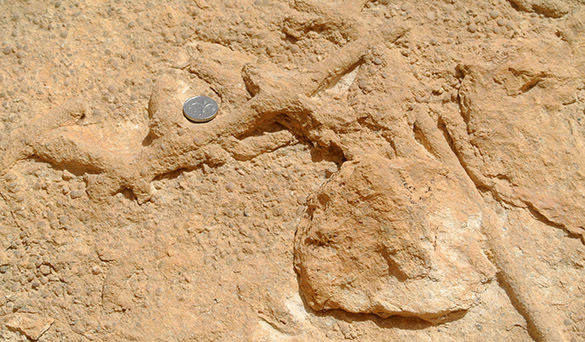 By stirring up the marl, the camels unearth fossils that would otherwise lay hidden. 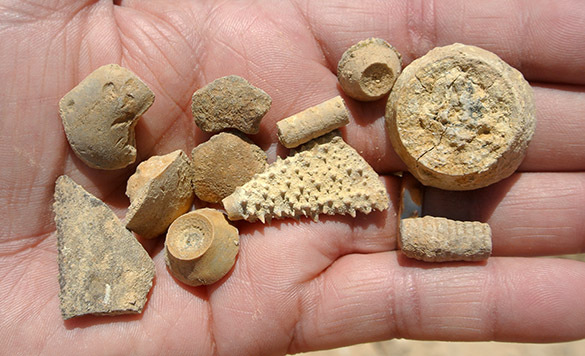 Here is a random assortment of crinoid and echinoid bits found in this camel haven. If we ignore the poop and flies, and avoid the angry males, these camels have done us a scientific favor!